Now you can apply the link tracking functionality that you know and love in Mail Merge to 1:1 emails for a more in-depth look at how your prospects are engaging with the content you send their way. 1. Open your email composer and type out your email like you normally would. 2. Place your cursor in the point in the email where you’d like to insert a tracked link. 3. 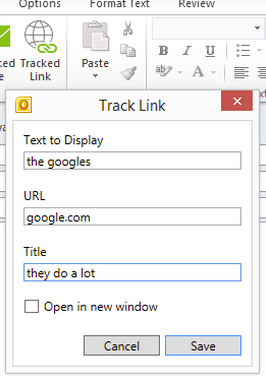 Click the “Tracked Link” icon in your Outlook ribbon. 4. In the pop-up window, fill in the text that you’d like to turn into a hyperlink, the URL, and the title. 4. We send you a notification when your prospect clicks the link!